Leaders have been dealing with challenging, uncertain business conditions for decades. Today, it’s a near-constant state of change. Organizations are required to not only adapt, but also anticipate change, and leadership has to keep up. Your voice is a powerful leadership tool that influences people’s perception, drives communication and helps you articulate your vision. Your voice punctuates your leadership style and directly affects your team’s faith in you. But what does a strong leadership voice mean? And how can you cultivate yours? What Is Your Leadership Voice? Your leadership voice isn’t just your tone or speaking style. It’s a reflection of your core values and communication skills that impact how you present yourself as a leader. Think about how you communicate. How do you handle conflict? Praise employees? Encourage collaboration? Lead projects? Deliver feedback? That’s your leadership voice. Leaders have different styles. Some take a hands-off approach, preferring to let employees drive their work with minimal supervision. Others are more task-oriented and like to be involved. Some leaders have an encouraging, coaching style while others are more assertive and direct. There are many misconceptions about what makes a powerful leadership voice. And considering that 55 percent of CEOs think a lack of trust is a threat to their organization's growth, communicating clearly and compassionately is more critical than ever. Your leadership voice has nothing to do with volume or projection. A great leader isn’t always the loudest extrovert in the room. An effective leadership voice isn’t about confidence, either. It’s about speaking with persuasive power — engaging employees, articulating your vision and inspiring innovation in your organization. You don’t need a manager title to develop your leadership voice. A strong voice benefits anyone, whether you’re speaking up in a meeting, providing feedback or pitching an idea to your boss. Watch this free webinar with tips & tricks to Discovering Your Leadership Voice. The way teams perceive leadership has an enormous impact on employee retention, job performance and overall trust. According to a Gallup poll, engaged teams show less turnover, higher productivity and profitability. 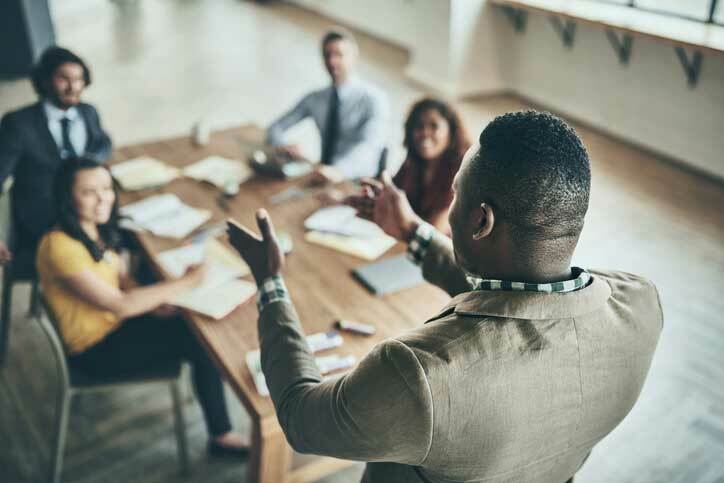 Despite its importance, leadership is a huge challenge for organizations — only thirteen percent of organizations say they do an excellent job at developing leaders. Poor leadership hurts productivity and morale. A strong leadership voice increases your influence and enables you to communicate more effectively with others. Here are a few qualities of a strong leadership voice. Receptiveness. You might have incredible vision and be a master of your craft. But it won't be reflected in your company if it's not communicated clearly and team members don’t buy into your vision. Consistency. Core principles guide your leadership voice through every interaction. Some leaders have a mental tagline they keep in mind when communicating, such as, “give the benefit of the doubt” or “listen first; react second.” It prevents a fight-or-flight or knee-jerk response when faced with tough situations. Resilience. A strong leadership voice is adaptable. It empowers leaders to respond authentically, effectively and constructively to whatever leadership situation or audience they encounter. Great leaders aren’t born — you can practice and shape your skills. Here are tactics to develop your leadership voice. Look inwards first. Write down your strengths and characteristics and be honest with yourself. What qualities worked for you in the past? What was successful? What can you improve on? Knowing your strengths, weaknesses and where you’d like to improve can help you outline an action plan to develop your leadership voice. Reading helps individuals be more effective at leading others. It increases verbal intelligence, making leaders more adept communicators. Reading novels can also improve empathy and understanding of social cues — traits linked to improved organizational effectiveness. Begin with reading through this Leadership Skills Activity Guide. Role models and mentors are helpful resources for developing your leadership voice. What leaders or managers do you admire? How did they handle conflict? What did you admire about them? Identifying what you value in other leaders will help you develop your perspective and values. There will be situations that challenge your leadership abilities. Maybe it’s a difficult employee you’re struggling to communicate with or an important pitch to investors. Find a mentor you can turn to when your leadership voice falters. They can help you talk through tough situations and develop tactics and talking points to ensure your leadership voice stays strong and you can rise to the challenge. Developing your leadership voice takes practice. Offer to take on a new project at work. Pitch your idea to your boss. Volunteer at a nonprofit, community organization or alumni association. Volunteering for new projects or initiatives will help grow your skills, stretch your leadership muscles and develop confidence. It’s a process. No one becomes a standout leader overnight. Continually evaluate, iterate and improve on your leadership voice as you grow in your career. Leadership development training is the perfect way to jumpstart your communication and leadership skills. New Horizons offers leadership training in Discovering Your Leadership Voice. Find the next scheduled course date that fits your schedule.